How Do I Start Windows Using Last Known Good Configuration? Last Known Good Configuration (Windows 7). Windows can encounter problems starting up if the system's registry or a driver's configuration has created a conflict that causes the system to fail to start. One of the easiest solutions that can get you back into your computer is starting using the Last Known Good Configuration, or LKGC for short, option. Starting Windows using Last Known Good Configuration is often the best first step when troubleshooting a Windows startup problem. As the name implies, it starts Windows using the last configuration of the system's registry and drivers that allowed it to start and shutdown properly. 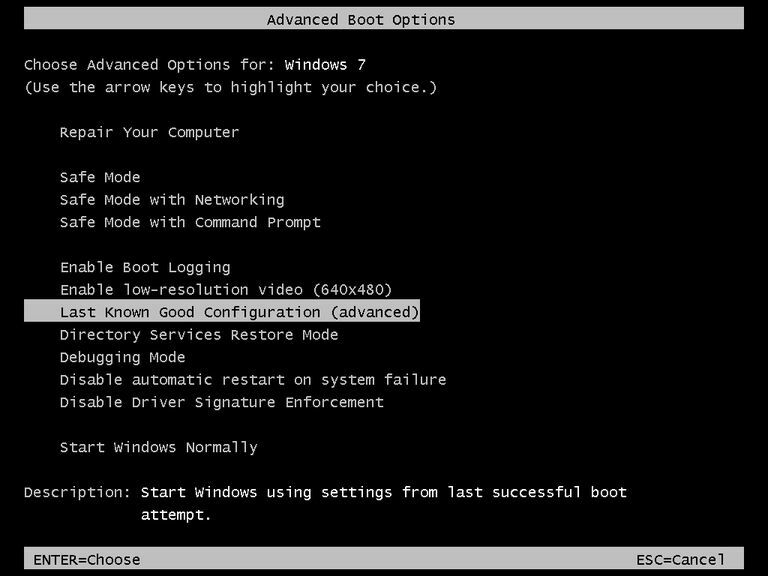 You can start Windows using Last Known Good Configuration from the Advanced Boot Options menu. Last Known Good Configuration is not available in Windows 10 or Windows 8. In most cases, if your Windows startup problem is not solved by starting with Last Known Good Configuration, the next step would be to attempt a System Restore. However, if you came here from a specific troubleshooting guide, your best bet is to follow whatever troubleshooting step is listed next. It's completely fine to try booting into Safe Mode before using Last Known Good Configuration. It's only after you've booted into Normal Mode and loaded Windows that LKGC might no longer be helpful. The changes made when starting Windows using Last Known Good Configuration cannot be undone. Don't let this deter you from trying Last Known Good Configuration - a working Windows with the previous session's driver and registry data is much better than Windows that you can't access at all. How Do I Automatically Repair Windows Problems? How Do I Disable a Device in Device Manager in Windows?